East London’s galleries opened their doors later into the sweet summer evening on this First Thursday of July, and as always did not fail to delight. LoVArts’ Danny Kitchener and Hannah Prime explored Hoxton and Shoreditch, discovering what was on offer this month. Around the Block, conveniently located in the heart of Hoxton, is currently exhibiting works by two of the most revered artists in the urban scene – Otto Schade and Inkie. 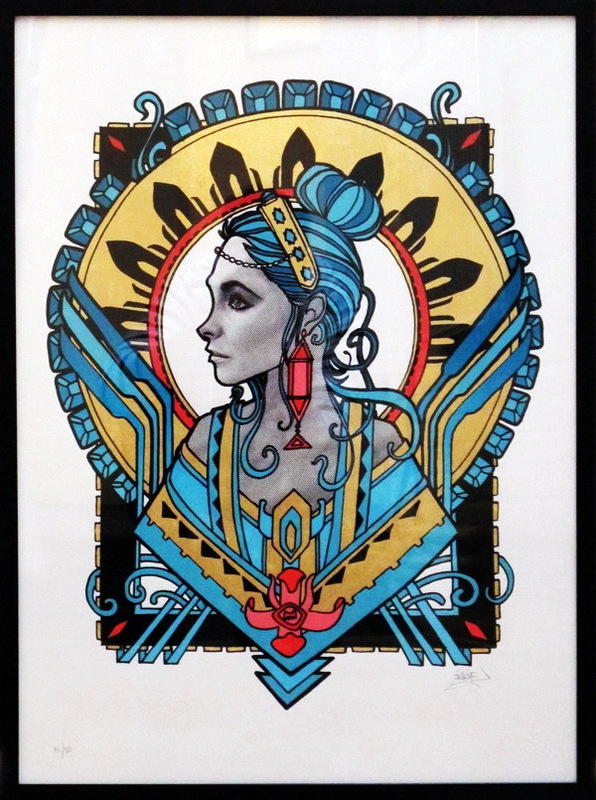 Inkie’s work is rooted in the Art Nouveau and is fused with an urban and graffiti style. Much like this exhibition, it is a collaboration that pays off. A strange kind of hybrid, both Alphonse Mucha and Banksy would surely approve of. The ribbons Otto Schade liberally uses to create his paintings characterize the body of his work. Although shocking, even the faintest of heart would have to acknowledge the pain staking amount of time it would have taken to create a single piece of work. Although the gallery space is boxy, the work on display has been arranged in such a way that highlights both the individual and collaborative strengths of the artists and their respective styles. The gallery is also selling a range of affordable ‘limited edition’ prints from both the artists. 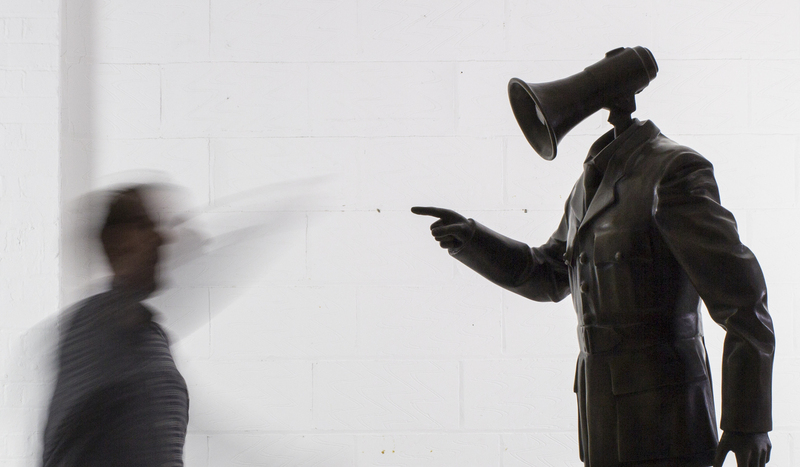 Another interesting exhibition in Hoxton is Hugo Farmer’s exhibition at the Hoxton Gallery on Kingsland Road. Respected and admired by his peers, Farmer has commissioned work for, and with, some of UK’s most renowned, applauded and iconic artists of the last two decades. The name of the exhibition alludes to Article 10 of the European Convention on Human Rights; in particular the right to freedom, expression and information. Considering the name of the exhibition, it becomes apparent immediately that the work will be politically driven. After little time in the gallery, it soon hits you that repetition is the name of the game here. The same imagery is repeated and heavily featured in most of the works. However this repetition doesn’t limit, but strengthens the show’s subject matter and its dark themes. The show, laid out much like a Chapman Brothers exhibition, is a mixed bag; it has a lot going on, but its lack of restraint and punk ethics should help appeal to a wide range of people. Stepping into the Howard Griffin Gallery on Shoreditch High Street is a step back into the 1970s and 1980s through the lens of Bob Mazzar. His exhibition, Underground, captures what is a long lost era in which the London tube network occupied a unique space. Brilliantly, it is also kitted out with old underground seating, to make the experience that bit more authentic. The London Underground can always be compared to a throbbing network of arteries and veins running underneath the surface of the city. In the photographs of Bob Mazzar, it is where people and ideas and cultures collide, where people brush shoulders with others they would not normally come into contact with. A gruff, uncomfortable elderly gentleman sits, head in hands, next to a beaming lesbian couple, brimming with love and happiness. A punk stares defiantly into the lens, her conservative fellow passengers averting their gaze. A couple, lost in their selves and the moment, bridge the gap between platform and carriage with their kiss. Bob Mazzar’s photographs make you smile. The little details tell stories, are snippets into people’s lives. His subject is humanity, in all its gritty beauty, and this is an exhibition not to be missed. This entry was posted in Artists, Exhibition, Review, Uncategorized and tagged Art, Bob Mazzer, exhibition, First Thursday, Hoxton, Hugo Farmer, Inkie, London, london visual arts, LoVArts, Otto Schade, Shoreditch, visual art. Bookmark the permalink.